Leh, April 15 (Scoop News)-DC/DEO, Leh Avny Lavasa in an endeavor to reach out to local population with the aim to make everyone familiar with their voting right and voting process visited Taru and Umla villages yesterday. Along with the district SVEEP team, DC conducted voters’ awareness program also in both the places. DC was accompanied by ADC Leh, Sachin Kumar and Abdul Wahid, Naib Tehsildar (ALMT). Villagers including Sarpanch and Nambardars turned up in good numbers at both the places and participated enthusiastically in the awareness camp. 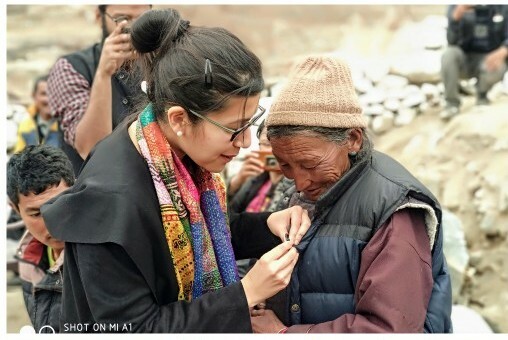 DC/DEO, Leh spoke about the importance of people's participation in elections and distributed election badges of "My Vote Counts" among the villagers to encourage them to cast their votes on May 6. She urged the villagers to exercise their right to vote without any fear or under any influence in the upcoming Lok Sabha Elections and elect their choice of leader. She said, "India is known for its transparent and impeccable election process all over the world and we should all feel proud to be part a of this election process". The SVEEP master trainers spoke in detail about the importance of individual participation in elections and educated them about the election process. A hand on training and demonstration on EVM/VVPAT was also conducted by the ALMT to make the people familiar with the process of voting using EVMs. They were also introduced about VVPAT machine, its importance and the need to use VVPATs.